"Becky, You have built one of the most relaxing getaway places we've stayed in. Love the humming birds and the racoon and her family. We enjoyed it all very much. (We) hope to be back again someday. You go girl!" Talk about a bundle of energy. Becky Halper was, by profession, a very active realtor in Eureka Springs ... since buying her own listing, Eureka Sunset is now her full time passion. She is here to make your stay perfect, but she will never impose. Her special designer touch, with its whimsical air, is present in the six dwellings tucked in among six acres of deep woods. She hails from Florida, but she has found her home in Eureka Springs. Marrying the love of her life, Fred, in 2007, together they have worked to provide every guest with a memorable experience. (Ozark AIDS Resource and Services) for the past fifteen years. And, oh, she loves a good margarita with salt! Fred, a full time mechanic, spends all his extra time at Eureka Sunset as the "pool boy".... even though they don't have a pool! He works very hard keeping everything in tip top shape. 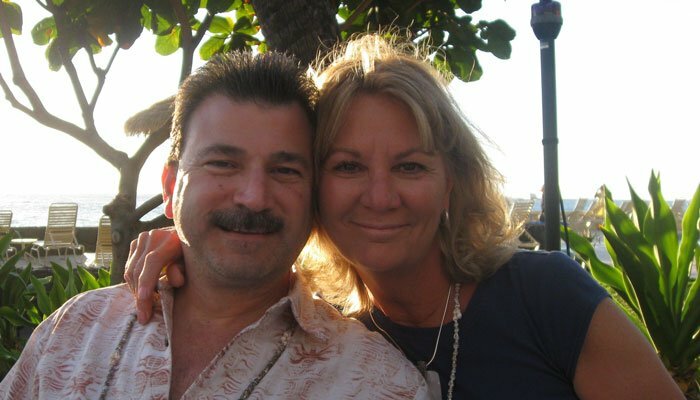 When asked about Eureka Sunset Cabins, Becky said, "My goal... is to build more cabins on our six wooded acres. I have decorated the designer cabins and cottage-style rooms as if I was the one staying there." She went on to say, "Many of my guests have said that very thing. They say I have not missed a detail, and they love the way I personalized the dwelling with family photos and memento trinkets in the grout of the fireplaces." Privacy leads to serenity. And you'll find it in abundance here. We'll never impose. If you choose, you may check in and count on never being disturbed until you leave. And, your stay is even more special with little touches like fresh coffee beans and microwave popcorn. You'll delight in our focus on smoke-free privacy. A smoking area is provided with each cottage style room and cabin on the back deck overlooking the Eureka Springs woods. 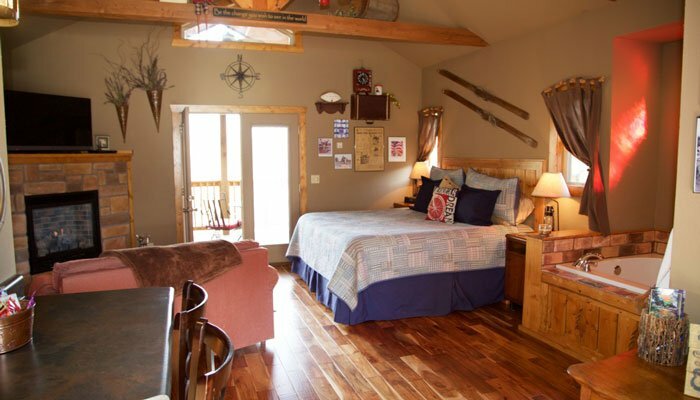 Appointments abound inside our designer-quality cabins and cottage-style rooms. Each follows a particular theme that is reflected again and again everywhere you look. This is but a part of the thought that went into designing Eureka Sunset Cabins. We are ready for your stay and your return when you make Eureka Springs a stop along the way. Nourish your soul and make memories that last a lifetime in our rustic, but elegant setting, built in such a way that you are among the treetops. Rustic elegance. The two are fused at Eureka Sunset Cabins. Our cabins become one with the deep woods with their rustic exterior, but once you enter the front door you become caught up in the well-appointed elegance of the interior. A quick glance at our photographs will make this quite evident to you. Each Cabin and Cottage-Style Room offer unique amenities. Please refer to the individual Cabin or Room pages for detailed descriptions of their amenities.